The Green-Duwamish River originates in the Cascade mountains and flows through farmland as well as several prominent cities, including Auburn, Tukwila, Kent, and Seattle. Because of decades of industrial pollution, deforestation, and floodplain development, the health of the river has diminished; and, populations of native Chinook salmon and steelhead have severely declined, leading to their listing under the Endangered Species Act. In 2011, the Washington Department of Ecology established a Temperature Total Daily Maximum Load for the Green River. This study showed that one of the largest threats to fish is lethal to sub-lethal water temperatures caused by the removal of tall, native trees from the banks of the river. The Muckleshoot Indian Tribe published solar aspect shade maps in 2014 that highlighted areas where shade was most critical to reduce high temperatures in the river. These studies helped inform the Re-Green the Green Riparian Revegetation Strategy for Watershed Resource Inventory Area 9; developed in 2016, the strategy sets goals to revegetate the Green-Duwamish shorelines with native riparian vegetation that will generate shade, cover, and food sources for fish. In the more urban areas of the watershed, multiple jurisdictions, a patchwork of private and public ownership, flood control facilities, a riverside recreation trail, and steep banks make this work particularly challenging. Achieving the revegetation goals identified in the Re-Green the Green plan requires coordination across multiple jurisdictions and the support of non-government partners in the community. This need for enhanced coordination in addressing water management in the Green-Duwamish Watershed has been recognized by federal agencies, including through the 2013 designation of the watershed as an Urban Waters Federal Partnership (UWFP). Partnerships and strong communication between government agencies and non-government organizations are key elements to overcoming the barriers to revegetation efforts of the urban sections of the Green-Duwamish River. The Green the Green Network (GGN) was developed over the last year under leadership of the Urban Waters Federal Ambassador, the King County Lower Green River Basin Steward and representatives from Forterra and American Rivers. With the intention of formalizing a partnership with clear goals and direction, leaders created the GGN to implement coordinated revegetation efforts in the watershed. Two initial GGN meetings took place in June and September of 2018, with plans to hold quarterly meetings moving forward. Representatives from organizations and agencies throughout the Green-Duwamish Watershed attended the meetings to better coordinate on the ground efforts, collaborate on funding opportunities, and discuss challenges like planting on levee facilities and adequately funding maintenance. Network members also shared information about their revegetation projects, updated King County’s Tree Planting Viewer with completed work, made plans to set priority planting areas, and discussed future partnerships. Informed by GGN participant surveys and with funding from the UWFP through the US Forest Service, the GGN recently hired a communication consultant to help unify their overall message. Namely, the GGN intends to improve the understanding that riparian vegetation provides value to both people and fish while offering consistent, compelling messages to residents and decision-makers that drive action towards increased riparian cover along the river. Partners involved in the Green the Green Network include government entities—Green-Duwamish Urban Waters Federal Partnership, King County, Muckleshoot Indian Tribe, Watershed Resource Inventory Area 9, King Conservation District, the cities of Seattle, Tukwila, Kent, and Auburn—as well as local organizations—Forterra, EarthCorps, DirtCorps, Green River Coalition, Duwamish Alive! Coalition, American Rivers, and Mid Sound Fisheries Enhancement Group. Non-governmental organizations and the cities of Tukwila, Kent and Auburn, are working together to restore public and private lands. Because of steep river banks and abundant private landowners, much of the work is done by staff or paid contractors. However whenever possible, community volunteers help aid in this effort. Two examples of the many community-driven restoration projects in the Lower Green Watershed include the Restore the Duwamish Shoreline Challenge and Fenster Nature Park. Driven by a Boeing Employees Credit Union (BECU) employee who began removing invasive plants on his own, the Restore the Duwamish Shoreline Challenge started officially in 2012. Since then, the project has grown. Forterra, EarthCorps and the City of Tukwila work together with multiple corporate partners to organize volunteers throughout the year. In total, nearly 2,000 volunteers have removed invasive plants and replaced them with more than 5,000 native plants to restore nearly 1 mile of shoreline. Volunteers work at the Duwamish Shoreline Challenge. Photos: Zizheng Cheng (left) and Nick Krittawat (right). Fenster Nature Park – the site of a major levee setback project – was revegetated in 2014 when 150 volunteers and a City contractor installed approximately 7,000 native trees and shrubs. Since then, the City of Auburn has hosted yearly volunteer events to provide supplements to and maintain plantings, with an estimated 500-700 volunteers involved through the years to help revegetate the park. 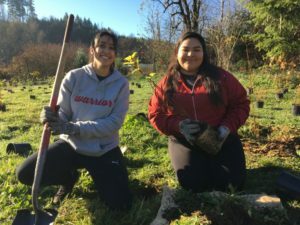 More recently, the City of Auburn worked with EarthCorps and King County to organize a large planting effort on a one-acre field on the south side of Fenster Park. This site was prioritized by the Muckleshoot Indian Tribe as having a critical need for shade, based on solar aspect. Groups of volunteers have worked to remove invasive plants and replant fast-growing deciduous trees for quick cover while different kinds of conifer trees will provide lasting cover. In November 2018, 70 volunteers came out to help plant 425 trees and 1000 shrubs, drawing volunteers from Green River College, Auburn high schools, and surrounding neighborhoods. In addition to site-specific projects, there are several programs engaging volunteers across a broader area. Duwamish Alive! brings together a diverse array of non-profits working on the Duwamish River to engage volunteers at more than a dozen sites along the river during two big events each year. Programs like the Green Kent Partnership, Green Tukwila Partnership, and EarthCorps’ Sound Stewards program train and empower community volunteers to steward publicly owned natural areas throughout the watershed and host their own volunteer events. communicate more clearly with each other and the greater community. Green-Duwamish River jurisdictions like Tukwila, Kent, and Auburn, and organizations like Forterra and EarthCorps, are playing a strong role in reaching the goals of the Re-Green the Green Strategy. In both community work areas—the Duwamish Shoreline Challenge and Fenster Nature Park—revegetation efforts provide shade and improve water quality in the rivers; all are benefits to the fish and the community alike. Total Maximum Daily Loads (TMDL) are calculations that establish minimum pollutant requirements for water bodies listed on EPA’s Clean Water Act 303(d) list. The leading national cause of impairment in rivers and streams is pathogens with 187,872 miles of reported rivers affected. Temperature is the 5th highest cause of impairment nationwide with 94,488 miles of rivers assessed and impaired by it (see National Causes of Impairment). Temperature is considered a pollutant because warmer water temperatures adversely affect aquatic plants and animals. Salmon, for example, are particularly sensitive to elevations in water temperature. Heightened temperatures allow disease to spread and decrease egg survival. In the state of Washington, where Salmon and other native fish are important parts of the ecosystem, temperature is the leading cause of impairment with 783.6 miles of rivers listed as impaired in 2008. The Washington State Department of Ecology established a temperature TMDL for the Middle and Lower Green River in 2011 (see Green River Temperature Total Daily Maximum Load). Since then, the Green the Green Network members have been doing important work to combat the effects of urbanization on native fish populations and aim to meet the goals of the temperature TMDLs through revegetation of riparian environments. Restoration is good not only for the fish populations but also for the overall health of the river systems. The goal of the Green-Duwamish Watershed Urban Waters Federal Partnership (UWFP) is to enhance their effectiveness operating through a locally-driven approach that meets the needs of people in the community.